This article first appeared in Personal Wealth, The Edge Malaysia Weekly, on April 23, 2018 - April 29, 2018. 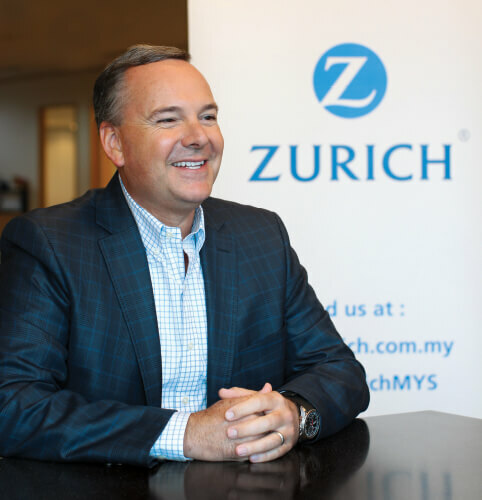 Zurich General Insurance Malaysia Bhd’s (ZGIMB) David Fike does not just want to jump on the financial technology (fintech) bandwagon. Instead, his goal is to harness its full potential by introducing ground-breaking products and services that not only benefit consumers but also the insurance industry. “The most exciting part of insurance today is getting ready for this [fintech wave] and making sure we have a differentiated proposition that allows us to take advantage of the change that is coming,” says the newly appointed CEO. Change is coming to the US$4.7 trillion (RM18.3 trillion) industry as insurers wake up to the idea to that insurance may look very different a decade from now with technology as a conduit. Insurance providers worldwide are pouring money to leverage all manner of innovations, new business models and apps that are being developed by start-ups aiming to challenge the sector’s bigwigs with what has been dubbed as insurance technology or insurtech. In Malaysia, the fanfare has been mostly limited to the emergence of insurance comparison websites and apps. But this is just the beginning, says Fike. “Everyone thinks aggregators are the future. I believe they will play a role in the process, but I don’t believe they will the big winners. The only thing we are doing when we use an aggregator is commoditising products and it does not necessarily complement what we want to do — that is to create a differentiated unique experience,” he adds. So, how is ZGIMB creating this unique experience? For one, it is leveraging the data-crunching capabilities of the digital world. Fike points out that all the extra information the insurer derives gives it the ability to better assess risks and personalise products. In early February, ZGIMB, Petronas Dagangan Bhd and Shieldcard Holdings Sdn Bhd announced a strategic partnership to extend the Mesra Personal Accident (PA) benefit exclusively to Petronas’ Mesra loyalty programme members. This allows Mesra cardholders to use their points to subscribe to the Mesra PA plan for only RM1 (100 Mesra points) monthly, when they spend a minimum of RM100 a month at any Petronas petrol station nationwide. Subscribers are entitled to daily hospital income of RM50 for a maximum of 30 days per insured event. In the event of death or permanent disablement of the Mesra cardholder in an accident, the family or next of kin will be entitled to a cash payment of RM25,000 (increased to RM50,000 if the insured event occurs on a public holiday gazetted by the government). Additionally, by registering for the Mesra PA plan, Mesra cardholders are automatically enrolled for Shieldcard’s AXXESS programme for free. This allows them to earn AXXESSpoints at participating merchants nationwide, which can help reduce or pay in full their annual motor insurance premiums. AXXESS monitors the daily spending habits of individuals at its partner merchants to enable point accumulation. Members can use the points to lower or completely offset their insurance premiums. This programme is more than just providing free personal accident coverage as the tripartite partnership gives ZGIMB access to the data of 2.8 million Mesra cardholders, says Fike. “Well, some people will say someone is paying for that plan. Yes, but the consumers aren’t,” he points out. “Mesra and AXXESS record the daily habits of individuals, be it pumping gas, booking holidays or shopping for groceries — the things you do regularly — and they partner those merchants. Now, if I can steer my customers from their preferred petrol station to a Petronas petrol station because we can give them a benefit, Petronas will pay for that. Access to data is a game changer for insurers, Fike stresses. With the programme rolled out, he is now set on harnessing another technology, one that is bolstered by the rise of telematics. The insurer is currently working on improving its presence in the motor insurance segment, specifically looking into the potential business opportunities from the use of radio-frequency identification devices (RFIDs). These readers, which are embedded with microchips, use electromagnetic fields to exchange data wirelessly. “Let’s talk about where the road tax is going to go. We are the eighth-largest general insurance and tak aful player in Malaysia today. There are more than 16 million motorised vehicles on our highways and for every single one of them, the owner is supposed to have paid road tax, but there are some who do not,” says Fike. “[To address the problem] the government is looking to simplify the process of paying road tax because, quite frankly, it is a hassle. So, how do you simplify that process? “The newest thing that is being discussed in the market is RFID, where details of your road tax can be stored in the device. The device itself is small, about the size of a finger. It has a chip inside and it is a sticker that you will have to put on your windscreen near your rear-view mirror. In a bid to reduce the congestion at toll booths and prepare for a gateless gantry system for electronic toll collection, the government has been testing out RFIDs on some 8,000 government emergency service vehicles since last year. If satisfactory, the system is expected to be rolled out nationwide in stages this year. How can an insurer such as ZGIMB benefit from this process? Fike draws attention to the fact that one cannot get the road tax done unless the motor insurance is renewed first. “So, it is a Catch-22 situation,” he says. He recognises that while such telematics technology can deliver insurance more effectively as well as make it cheaper and easier to obtain, it gives the underwriters far greater insight into where the risks really lie. This, of course, raises the issue of privacy. “The biggest issue that would stop this initiative is privacy. In one way, the RFID is a tracking device, so the public may not like that,” says Fike, who foresees an intense debate that would open up a can of worms on issues such as privacy, how risk is perceived and possible discrimination. Fike studied economics at Allegheny College in Pennsylvania, the US. He started his career in insurance as an underwriter for Chubb Ltd. In the last 30 years, he has worked for insurers such as American International Group Inc (AIG), Prudential Financial Inc, ACE Ltd and Cigna Corp. He joined Zurich Insurance in Malaysia as president of the general insurance business in 2014. He was appointed CEO last November following the conversion of the insurer’s composite insurance business into two separate legal entities for life insurance and general insurance. The conversion was necessary to adhere to the requirements set out under the Financial Services Act 2013, which prohibits an insurance company from holding a composite licence to carry out both life and general insurance businesses under a single entity. “Otherwise, I still do the things I was entrusted to do when I took up the position in 2014. But the industry has evolved since then. At the time, we were the 13th largest player in the country and growing at market rate. We focused on selling motor insurance policies through agents,” says Fike. “If you look at what we have been doing in the last four years, a lot of it was identifying our purpose for customers, what our aspirations are, what we could be in Malaysia … and then developing a strategy for how we will get there. While insurance distribution will undoubtedly be increasingly digital, he does not believe it will render the human agency force irrelevant. However, he recognises that there is a need to tackle the issue of insipid engagements. “We have noticed that our core strength is the traditional agency channel. I would tell you that this channel will be around for the foreseeable future,” says Fike. Another key strategy he is working on is to improve insurance penetration. “A lot of what insurers do, and what our competitors do, is look at their slice of pie and ours. And they say, ‘How do I take a little of my competitors’ pie?’ I agree that it is one way of doing it, but all you do when you take a competitor’s slice of pie is commoditise your product and there is no differentiation or uniqueness,” says Fike. So, for ZGIMB to stand out from its peers, its aim is to increase the “overall size of the pie”, he says. He points out that only 55% of Malaysians are insured and the industry aims to increase that to at least 75% by 2020 and to ensure that the population is adequately insured. “We are going to look at our core channel of distribution, which is the agency force, and we are going to fortify that for what will take place in the future, for example, how new technology will play a role. That way, we can enable the core channel to be better prepared for how consumers want to interact with the agency force,” says Fike. “One of the activities we did with one of the larger agency teams is that we helped them put digital application processes on their platform. So, customers can use their mobile phones to buy insurance. That is one of the things we have done to fortify our core channel. “Another key focus is retaining our existing customer base. We lose a lot of our customers every year because there is not a lot of trust. They will move based on price. So, what we want to do is make sure they see value in everything we do, and not just when we pay a claim. Apart from introducing a relatively free personal accident insurance plan, Fike says ZGIMB has improved its product pricing following the liberalisation of the motor and fire insurance tariffs, also known as detariffication. “There is a segment or there are multiple segments of customers out there whom we know are better drivers. We have completely revamped our rating system. For example, our data shows that female drivers are, statistically speaking, better drivers. So we took that segment and said we are going to improve their rates,” he adds. “But we did not stop at just reducing rates for the good segments. We also felt that there are things those segments need that may be different from the other segments. These add-ons cover a variety of things depending on what car you drive. Going forward, there will much more focus on catering for millennial consumers, who are by far the most enigmatic group insurers have to deal with. “I can assure you that my teenagers do not want anything to do with the bank, what more with insurance,” says Fike. “The insurance buyer of tomorrow will be very different. First of all, they will want less human contact. They will also want simplicity, accessibility and affordability. This is crucial as people don’t generally trust insurance companies, he says. That is why it is important to leverage partnerships, he points out. Seeing the kind of disruption that is already happening, Fike has no pat answers to what the future will bring. Instead he shares a story on how technology is transforming the claims process. He says an insurer in Europe, which is conducting trial runs of using drones and telematics to assess the damage of a client’s vehicle that has been involved in an accident, has made the entire process a breeze. “Two cars were involved an accident. One was a beautiful sports car, the other was a luxury sedan. The insurance company calls the client in the Porsche almost immediately after the accident to check on the driver. ‘Our indicators tell us that you were just in an accident, is that true?’ and the guy says, yes, he was. “The insurance company employee then asks, ‘Are you okay? Do you need any medical assistance?’ The driver says he is fine, but the car cannot be driven. “The insurance company employee then proceeds to tell him that he has already dispatched a drone to the scene of the accident and a tow truck is on the way to assess the damage and collect the vehicle. Meanwhile, an Uber will arrive in four minutes to get him to his destination. Fike hopes to be able to put similar technologies in place during his time with the insurer. While ZGIMB may still be far from getting such developments on board, the global brand is close to achieving this in the other countries in which it operates, he says.